Portable electronic devices and electric cars can greatly benefit from lithium-air batteries, as these batteries have the potential to provide a high energy output in proportion to their weight. However there are some serious negatives. These batteries waste a lot of the injected energy as heat and degrade comparatively fast. To pump oxygen gas in and out they need additional components that are expensive in an open-cell configuration, which is highly different from traditional sealed batteries. 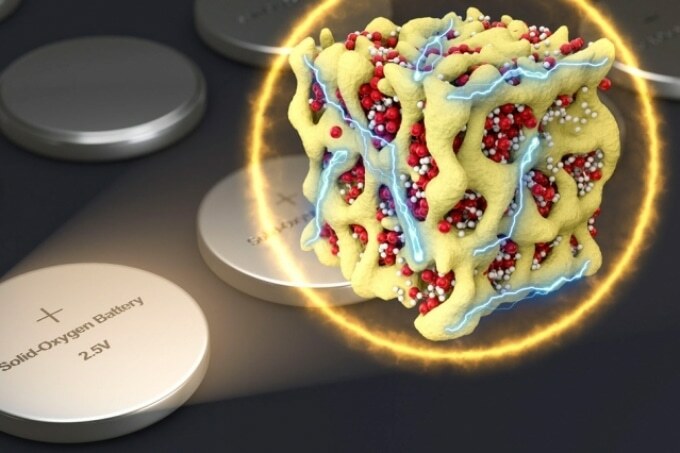 A new variation of the battery chemistry has been developed recently, which could be used in a traditional, completely sealed battery. It has similar theoretical performance as lithium-air batteries, and the potential to overcome the negatives. The new battery idea, called a nanolithia cathode battery, is illustrated in a paper in the Nature Energy journal by Ju Li, the Battelle Energy Alliance Professor of Nuclear Science and Engineering at MIT; postdoc Zhi Zhu; and five others at MIT, Argonne National Laboratory, and Peking University in China. Li explains that one of the downsides of lithium-air batteries is the inequality between the voltages involved in discharging and charging the batteries. The output voltage of the batteries is over 1.2 volts lower than the voltage used to charge them, which signifies an important power loss during each charging cycle. You waste 30 percent of the electrical energy as heat in charging. … It can actually burn if you charge it too fast. Traditional lithium-air batteries take in oxygen from the air to initiate a chemical reaction with the lithium present in the battery during the discharging cycle, and this oxygen is then discharged again into the air during the reverse reaction in the charging cycle. In the new alternative concept, the same type of electrochemical reactions occurs between oxygen and lithium during discharging and charging, but they occur without ever allowing the oxygen to revert to a gaseous state. Instead, the oxygen remains within the solid and changes directly among its three redox states, while bound in the form of three diverse solid chemical compounds, Li2O, Li2O2, and LiO2, which are blended together in the form of a glass. This decreases the voltage loss by a factor of five, from 1.2 volts to 0.24 volts, so just 8% of the electrical energy is converted to heat. This means faster charging for cars, as heat removal from the battery pack is less of a safety concern, as well as energy efficiency benefits. This method helps to overcome another problem with lithium-air batteries: As the chemical reaction involved in charging and discharging transform oxygen between solid and gaseous states, the material undergoes large volume modifications that can upset the structure’s electrical conduction paths, thus greatly limiting its service life. The new formulation’s secret is developing nanoscale particles, which contain both the oxygen and the lithium in the form of a glass, enclosed firmly within a matrix of cobalt oxide. The research team refers to these particles as nanolithia. In this form, the transitions between LiO2, Li2O2, and Li2O can occur totally inside the solid material, he says. The nanolithia particles would usually be highly unstable, so the team embedded them within the cobalt oxide matrix, a sponge-like material with pores measuring just a few nanometers in width. The particles are stabilized by the matrix, which also acts as a catalyst for their transformations. Traditional lithium-air batteries, Li explains, are “really lithium-dry oxygen batteries, because they really can’t handle moisture or carbon dioxide,” so these have to be cautiously scrubbed from the inward air that feeds the batteries. “You need large auxiliary systems to remove the carbon dioxide and water, and it’s very hard to do this.” But the new battery, which does not have to draw in any external air, circumvents this problem. The team states that the new battery is innately protected from overcharging, as the chemical reaction is naturally self-limiting - when overcharged, the reaction shifts to a different form that stops further activity. With a typical battery, if you overcharge it, it can cause irreversible structural damage or even explode. [But with the nanolithia battery] we have overcharged the battery for 15 days, to a hundred times its capacity, but there was no damage at all. In cycling tests, a lab edition of the new battery underwent 120 charging-discharging cycles, and revealed less than a 2% capacity loss, signifying that such batteries could have a long practical service life. Since such batteries could be installed and operated in a similar manner to traditional solid lithium-ion batteries, without any of the auxiliary parts needed for a lithium-air battery, they could be easily fitted into current installations or traditional battery pack designs for electronics, cars, or even grid-scale power storage. As these “solid oxygen” cathodes are much lighter than traditional lithium-ion battery cathodes, the new design could accumulate nearly twice the amount of energy for a given cathode weight, the team explains. With additional refinement of the design, Li feels that, the new batteries could eventually double that capacity once more. All of this is achieved without introducing any pricey parts or materials, according to Li. The carbonate used as the liquid electrolyte in this battery “is the cheapest kind” of electrolyte, he says. The cobalt oxide part weighs less than 50% of the nanolithia part. In general, the new battery system is “very scalable, cheap, and much safer” than lithium-air batteries, Li says. The team hopes that within a year, this lab-scale proof of concept can move to a practical prototype. This is a foundational breakthrough, which may shift the paradigm of oxygen-based batteries. In this system, commercial carbonate-based electrolyte works very well with solvated superoxide shuttles, which is quite impressive and may have to do with the lack of any gaseous O2 in this sealed system. All active masses of the cathode throughout cycling are solid, which presents not only large energy density but compatibility with the current battery manufacturing infrastructure. The MIT research team included Akihiro Kushima and Zongyou Yin; Lu Qi of Peking University; and Khalil Amine and Jun Lu of Argonne National Laboratory in Illinois. The work was supported by the National Science Foundation and the U.S. Department of Energy.